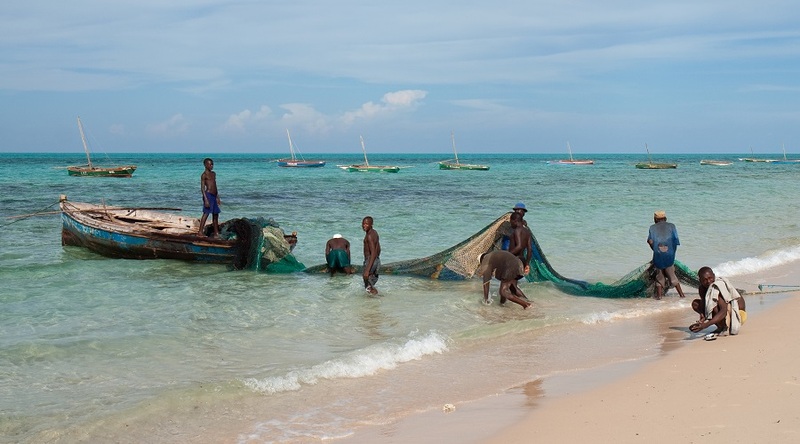 Fishermen holding a net between boat and beach at Pinda, Mozambique. Photo by Stig Nygaard, Wikimedia Commons. Countries’ improvements to their fisheries statistics have been contributing to the false impression that humanity is getting more and more fish from the ocean when, in reality, global marine catches have been declining on average by around 1.2 million tonnes per year since 1996. A new study in Marine Policy explains why the reconstructed catch data of the Sea Around Us show declining fish catches, while the Food and Agriculture Organization of the United Nations claims that catches have been more or less ‘stable’ since the 1990s. The Sea Around Us is a research initiative at the University of British Columbia and the University of Western Australia. The problem – say authors Dirk Zeller and Daniel Pauly- occurs as an inadvertent side effect of well-intentioned efforts by countries to improve their national data monitoring and reporting systems. As they include new information, for example of a previously unmonitored or poorly-monitored fishery, region or fleet, these new data add additional catches to those of already monitored sectors, thus creating the impression of a growing trend. “In our paper, we use the example of Mozambique where officials reported that small-scale catches ‘grew’ by 800 per cent from 2003 to 2004. This is incorrect. What happened was that the small-scale sector was massively under-represented in the reported data for the longest time and when a new reporting scheme was put in place in the early 2000s, improved catch data by the always-present subsistence and artisanal fisheries were added. A very similar amount of fish was caught in previous years, it was just not registered in the reported data,” says Zeller, who is the lead author of the study and head of the Sea Around Us – Indian Ocean at the University of Western Australia. This means that when Mozambique submitted its data to the UN agency, they were already biased as neither the country’s statistical agency nor FAO insisted on undertaking retroactive adjustments. According to the researchers, many countries’ statistics have the same issue. “The problem is that these data are assembled by FAO and presented as global trends in the widely used State of the World Fisheries and Aquaculture report. But by not accounting for the presentist bias over an entire reported data history, FAO is misinterpreting trends,” says Pauly, Principal Investigator of the Sea Around Us at the University of British Columbia. Incomplete time series influenced by the presentist bias is what leads FAO to claim that fisheries catches peaked at 86 million tonnes in 1996 and kept growing until stabilizing at around 91 million tonnes per year. 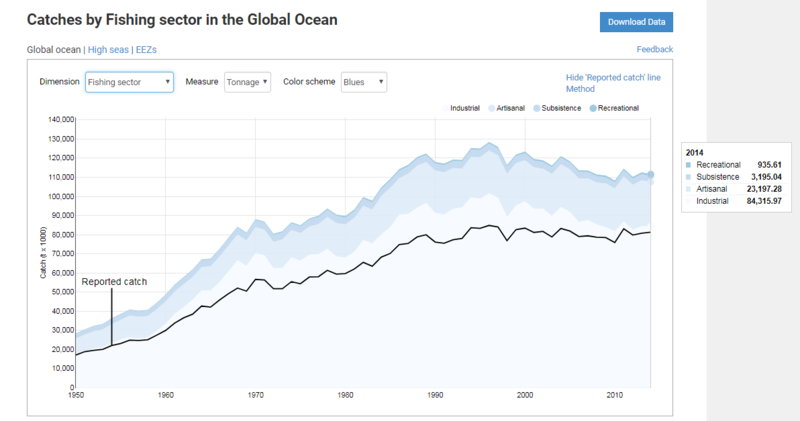 Sea Around Us data accounting for both reported and unreported catches show, on the other hand, that overfishing allowed for a peak number of 130 million tonnes in 1996 but also led to a sharp plunge in catches, which have decreased to about 110 million tonnes in recent years. Zeller and Pauly emphasize that countries’ efforts to improve the collection of fisheries statistics are highly commendable and should be encouraged. Yet, they stress that retroactive corrections that go as far back in time as any fishing activity existed ought to be made at the same time to avoid disseminating misleading fisheries trends. The scientists suggest using methods such as the Sea Around Us’ catch reconstruction approach to fill gaps with best estimates of unreported catches based on harmonized data and information from a wide range of sources. To schedule interviews with the authors, please contact Valentina Ruiz Leotaud v.ruizleotaud(at)oceans.ubc.ca | +1.604.827.3164. That’s interesting. Years ago, when I worked for FAO, our statistics branch dealt with that in reviewing stats submitted to us by governments. We thought we dealt with it, but apparently not now. The addition of new data for fisheries newly set up, especially for previously unexploited species has always presented a problem but not an intractable one. FAO cannot change the figures offered but can surely make sure the known features are properly dealt with in analytical publications of the sort such as estimates of overall trends.